May Your Fingers Be Nimble, Your Threads Seldom Tangle & Your Love Be Apparent in all You Create! Hi, I'm Barb and I love to Cross Stitch and Quilt. I thought retirement would give me more time to persue my crafting interests, but I'm always so busy still! I belong to several on-line groups for the above crafts and do mostly charity work now. Soooo... welcome to my room! Sonda - Who has time to stitch???? 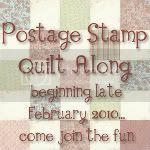 Bonnie - Quiltville's Quips & Snips! !